The first wave of racers bursts off the starting line as the second wave moves into position. 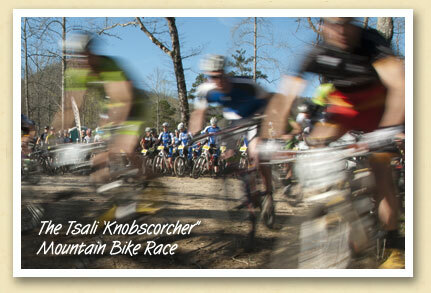 It’s the start of the annual ‘Knobscorcher’ mountain bike race at the Tsali recreation area near Bryson City. The Knobscorcher is one of four popular mountain bike events held at Tsali each year and one of 10 races in the South Eastern Regional Championship Series where racers throughout the southeastern US compete for cash, prizes, and the honor of being the best cyclist in this part of the country. Amateurs, experts, and professionals all hit the flowing, 15 mile cross country course. 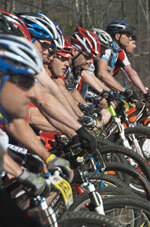 Amateur groups rode one loop and experts and professionals sprinted two for a total of 30 race miles. There was even a kids course. The SERC series, 12 Hours of Tsali, Tsali Xterra, and Tsali Challenge are all organized by GoneRiding, a mountain bike event organizer out of Ocala Florida. Thanks to Andy Zivinsky and Diane Cutler of Bryson City Bicycles for their assistance with this week’s Postcard.